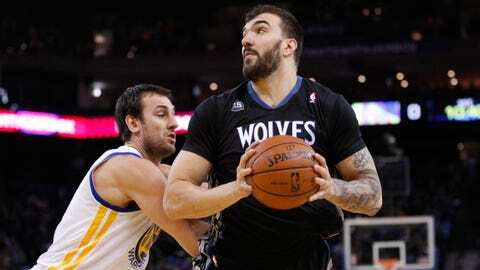 Minnesota's Nikola Pekovic is second among NBA centers in scoring at 18 points per game. He leads the league in second-chance points and points in the paint and is also averaging a career-high 9.1 rebounds per game. Only one Bruise Brother is going to New Orleans. Reserves for the 2014 NBA All-Star Game were announced Thursday night, and Timberwolves center Nikola Pekovic wasn’t among the frontcourt players selected by the Western Conference’s head coaches. Instead, Houston’s Dwight Howard, Portland’s LaMarcus Aldridge and Dallas’ Dirk Nowitzki will join Kevin Love and the rest of the West team Feb. 16 at New Orleans Arena. Pekovic’s best campaign to date and a strong Minnesota marketing push — featuring a vinyl album dubbed "The Bruise Brothers" that was sent to every Western Conference coach — weren’t quite enough to send two Timberwolves to an All-Star Game for the first time since 2004. Pekovic is currently out with right-ankle bursitis until at least next week and may not have been able to play anyway. But coaches’ votes had to be submitted by 11 a.m. CT on Tuesday. The extent of Pekovic’s injury wasn’t made public until Tuesday afternoon, so it would’ve had little effect on a coach’s ballot. What coaches did see when they considered Pekovic is a 6-foot-11, 285-pound monster in the middle of a rock-solid fourth NBA season. Before leaving Monday’s game with soreness that was later deemed bursitis, Pekovic ranked second among NBA centers in scoring at 18 points per game. He leads the league in second-chance points and points in the paint and is averaging a career-high 9.1 rebounds per game. His 53.3-percent field-goal shooting is also the best of his career. But he’ll only be able to watch in a couple of weeks as Love, his frontcourt mate, makes his third All-Star appearance and first as a starter. 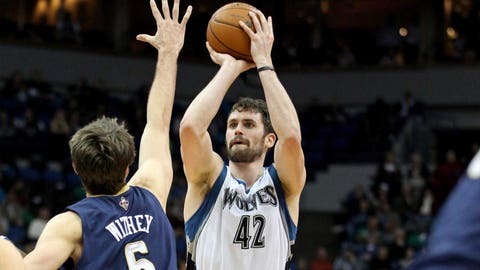 The last pair of Timberwolves to make the midseason classic was Kevin Garnett and Sam Cassell in 2004. Former coach and current president of basketball operations Flip Saunders coached that team. Joining Love as West All-Star starters, as voted in by fans, are Kevin Durant, Blake Griffin, Stephen Curry and Kobe Bryant. The backcourt reserves are James Harden, Damien Lillard, Tony Parker and Chris Paul. The Eastern Conference squad is comprised of Dwyane Wade, Kyrie Irving, LeBron James, Paul George, Carmelo Anthony, Chris Bosh, DeMar DeRozan, Roy Hibbert, Joe Johnson, Paul Millsap, Joakim Noah and John Wall.